Following the use of local handstamps for the Ancient Britain stamp issue Royal Mail is making a similar arrangement for mail posted close to the mills featured on the Windmills and Watermills stamps issued today. New Abbey - the box at 4-6 The Square, New Abbey Dumfries DG2 8BX. Cheddleton Flint Mill - Outside the old Post Office - 27 Cheadle Road, Cheddleton, ST13 7HN. Felin Cochwillan Mill - the box located at the junction of Bro Emrys and Cae Gwgin, LL573UT. * This box appears to be on a private road inside The Mill Caravan Park, about 3 minutes away from the mill itself. The handstamps will be used for five days until Saturday 24 June. Collectors should clearly indicate which handstamps they want and for which dates. Thanks to EM in Gloucester I can show the handstamp used for New Abbey Corn Mill in Scotland. Seems to have passed through the system with no other postmark and no bar-code (which is as it should be) unlike others which have been reported to have received an ink-jet postmark as well. Note that the inscription is now the proper black on white instead of being reversed out of the black border. It's a good illustration too: not much else could have been well done but it could have been a lot worse. 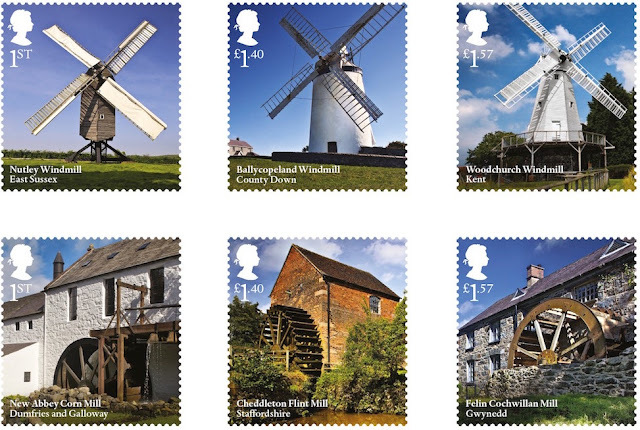 For each of the stamps, Royal Mail will provide a special handstamp on all mail posted in a postbox closest to where the windmill or watermill is located for the next five days. Presumably after that the mill or postbox will be moved? Collectors may be wondering when they will receive their covers with these handstamps. One who did has sent me this reply from the Royal Mail Press Office (further reinforcing my belief that this was one of the reasons why the Landmark Buildings did not have local handstamps). As the story appeared in Stamp Magazine, I have been inundated with requests for the postmarks. As such, I am waiting until the end of the month to collect them all, then will have them all sent to the handstamp team to complete in one session. So we should get them some time in August - not bad for a 20 June stamp issue which some dealers and collectors - already alerted here and in specialist society journals - sent away on the day of issue! 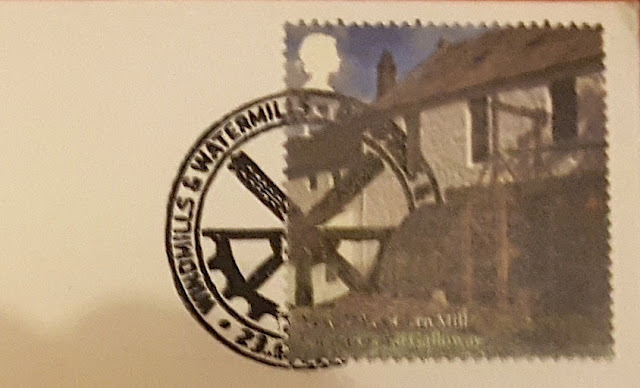 I have got my mum to get me a New Abbey Corn mill stamp on a New Abbey Corn mill postcard and hopefully the special cancellation by posting it in the New Abbey box today. I will forward an image when it arrives. The Ballycopeland postbox is indeed located in Ashley Park, Millisle (Co. Down). The Mill Caravan Park is nearby but the postbox is not there, it's at the road junction where Ashley Park meets the Moss Road (B172). Moss Road is the direct route from Millisle to go to Ballycopeland Windmill. The postbox can be seen on Google's Street View - an EIIR lamp box on a modern black metal post. There's a more interesting VR wallbox along Windmill Road (off the Moss Road) that is actually a little nearer to the windmill than Ashley Park - but in a more rural location. A handstamp obtained by posting at Ashley Park has been returned with the addition of a wavy line machine cancellation on top of it. The handstamp is barely readable and must have been applied by someone with no knowledge or experience of philatelic handstamping. The Ashley Park postbox has no notice or indication of any kind of its special five-day status. Thank you for this extra information John. I'm sure if you sent your cover to the press office it would be replaced. The mail is supposed to be segregated so that it doesn't get the machine cancel in Belfast.